Menton Daily Photo: Free Parking! Thank you Monsieur le Maire for your Christmas present! 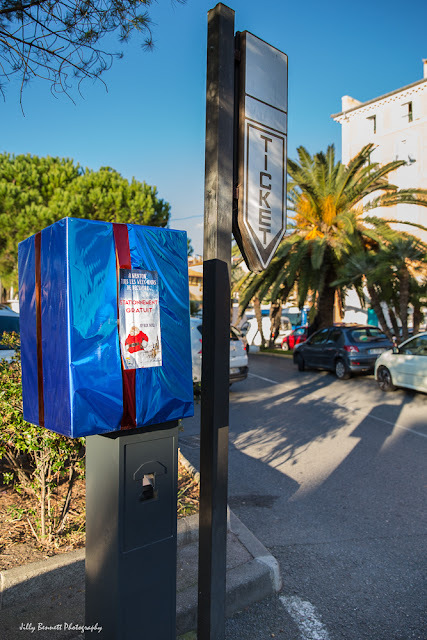 A nice surprise was waiting at every parking meter in Menton yesterday. Free parking on each Saturday and Sunday in December. (in fact Sundays are always free) - but a super surprise for Saturday. Merci Monsieur le Maire pour votre cadeau de Noël! Une belle surprise attendait à chaque parcmètre à Menton hier. Parking gratuit chaque samedi et dimanche de Décembre. En fait, les dimanches sont toujours gratuits - mais c'est une super surprise pour le samedi. That's good. Here in the city, the public meters are always free on Sundays as well. Another reason to love Menton, although we never had a car there after our first visit. You can walk almost everywhere as long as you can handle hills and stairs, and the taxi drivers are some of the best we have encountered anywhere.